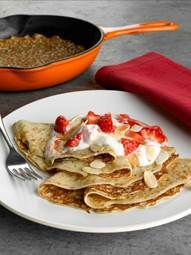 A truly indulgent pancake recipe, this is something you’ll want to eat more often than just once a year on Pancake Day! Ideal for breakfast or dessert, the strawberry, caramel and yoghurt topping is also delicious on toasted waffles or slices of Madeira cake. Leave the batter to stand until the top side looks dry and the bottom is golden, usually around 30 seconds. Using a fish slice or a flick of the wrist, turn or flip the pancake to cook the other side. Once cooked pop it on a plate, cover with foil and keep it warm in the oven. Repeat this till al the batter is used up and you have a pile of pancakes. 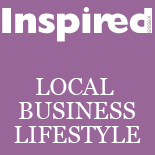 This entry was posted on February 15, 2012 by inspiredessex in Dine in Style, Magazine and tagged Chelmsford, Inspired Essex Magazine, pancake recipes, pancakes.